MSA offers free file hosting so you can add a file to an email. You can upload and share many types of files including images, documents and spreadsheets. We don’t allow traditional email attachments. Attachments can slow or stop bulk email delivery, or cause security software to completely block your email. Instead, we’ll help you upload a file from your computer where we store the file and host it. To share your hosted file, link to the file in your email. Just click a button, select your file or image and it's displayed or linked to your message. 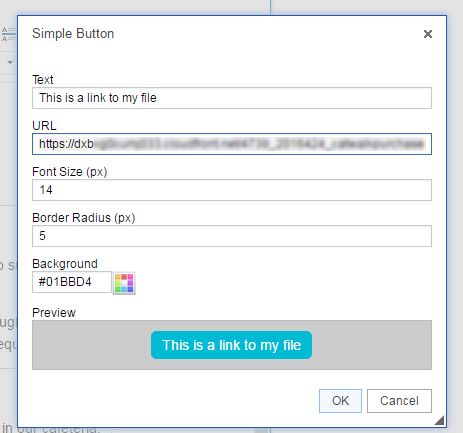 To insert a link to a file, click the Insert File button and select a file from your computer. File types supported are xls, xlsx, pdf, doc, docx. You'll then be prompted for the name of your link. Use text that encourages the reader to click on the link. You can style as a text link or you can display as a button. Either way, when the reader clicks they will be opening your file. If you've elected to insert your file link as a button, you can style by clicking on the button icon in the Editor toolbar. This allows you to change the text and color. DO NOT remove the URL as this is the link to your file!